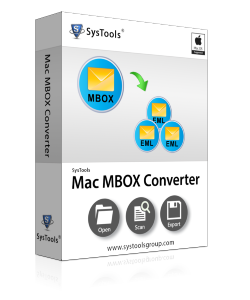 MBOX to EML Converter for Mac & Windows is a spectacular application to perform the conversion of multiple emails of an MBOX file to reliable EML file format. It is a best ever Software used for MBOX to EML extractor. 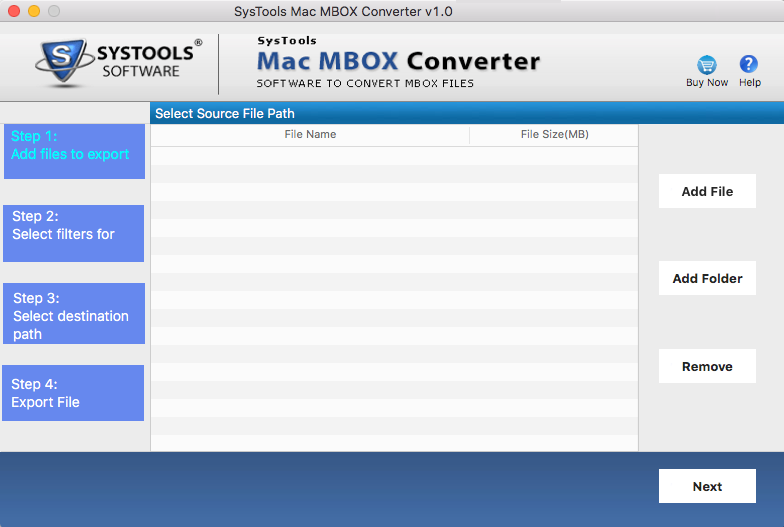 The software converts MBOX files into EML files in Bulk. The software has the capability to export .mbox file in two ways. Option to Switch View according to comfortability. 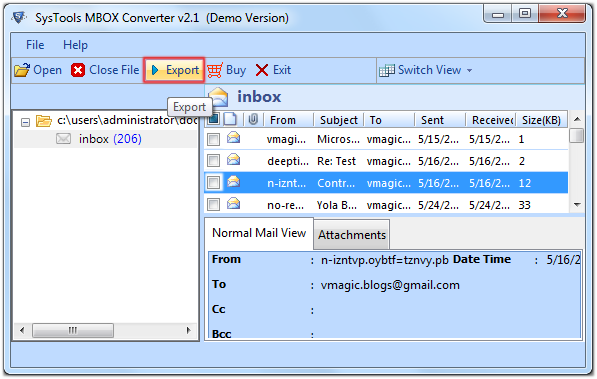 The tool converts all .mbox extension files supported by any email-client like Thunderbird File, Mac Apple Mail File and PocoMail File etc. The working of the software is very easy to execute and a user doesn't need to have much technical knowledge to operate it. Working procedure of MBOX to EML Converter for windows is revealed below. Take a glance and follow the working steps. 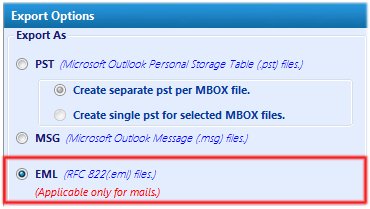 First Way of Converting MBOX files into EML : User can select MBOX mails directly from the Inbox through the Check Box by clicking right. 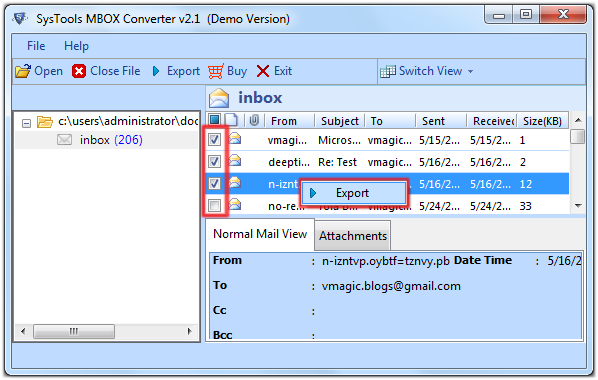 This option provides users to Export desirable MBOX files within the inbox, after selecting desired mails click on "export" button. 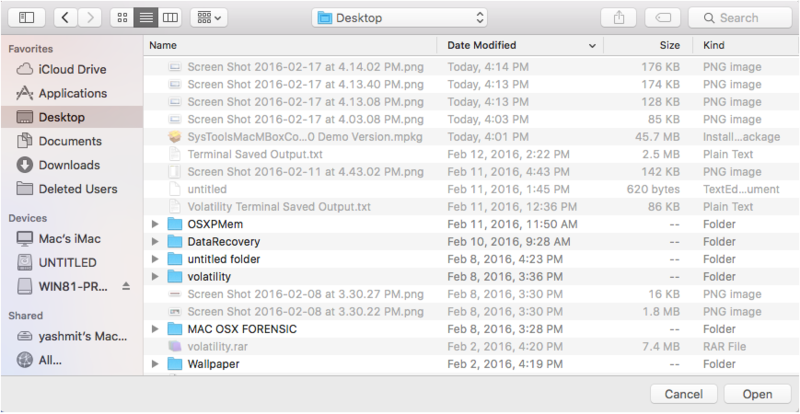 When user gives the command to export then tool will ask to choose File Format. Click on the EML File format. Next part is to choose name of the EML file. Software will give you different types of naming convention, choose one file name format from these name to export EML mails exactly like these formats. Second Way of Exporting : In this method software will provide Export option on the "Tool Bar". Click on that and export entire mailboxes folder. 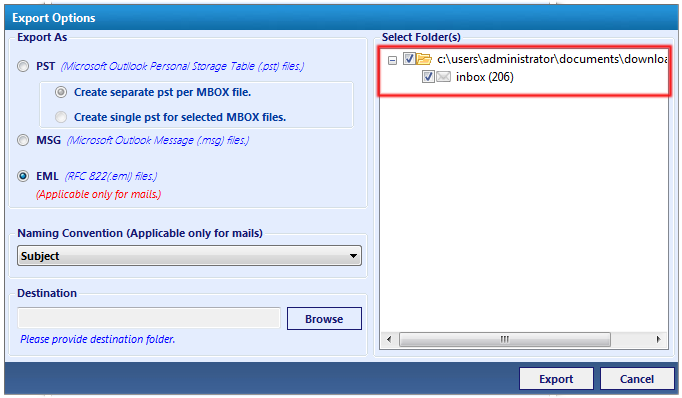 You cannot get a chance to choose single e-mail, here you can choose entire mailbox folder. Here you can see that you are not able to choose particular mail, you have to choose complete mailbox. You have to also provide the location where-ever you want to save/store your EML file by browsing. When you have done with the selection part, the tool will Start Exporting MBOX file into EML. It will take few seconds only. When MBOX converter to EML software completes its Exportation part it will show you Export report, just click on the OK button to proceed further. The Export Process Completes, click on OK. Saved EML mails are exported and save without affecting internal structure and formatting along with mail's attachments. 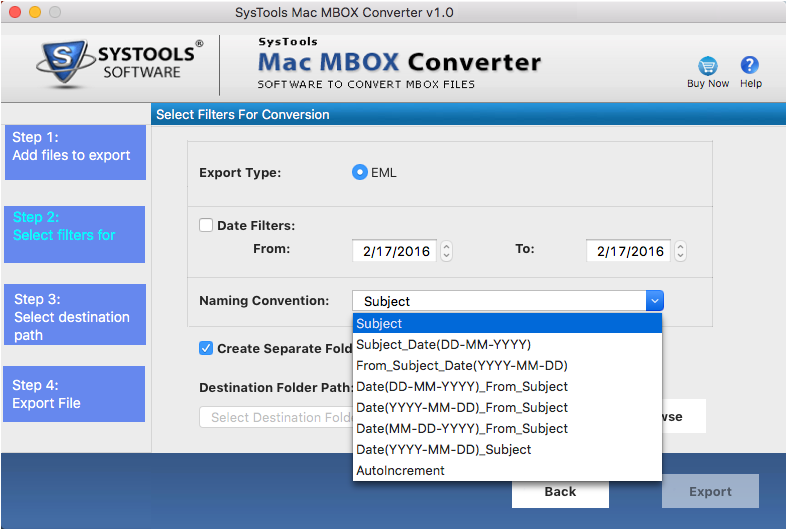 Convert multiple MBOX files to EML for mac while maintaining all emails properties with proper HTML format after export. 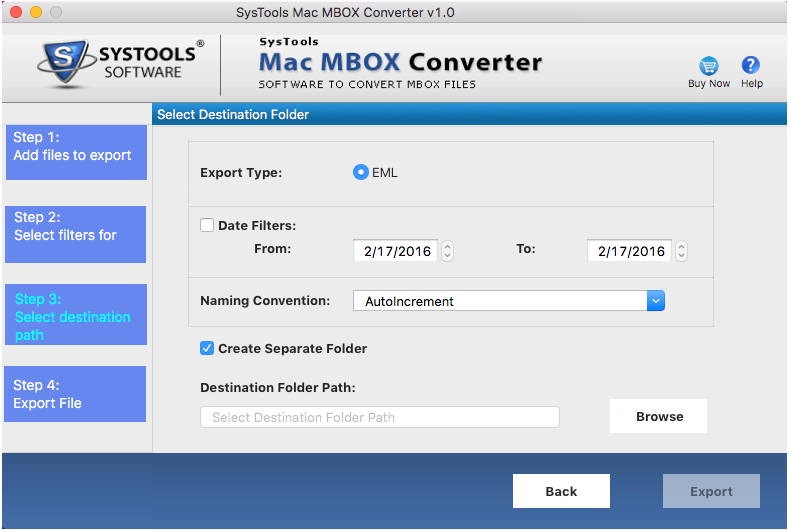 Follow the below step by step guide with screenshots for Mac MBOX to EML Converter. Now MBOX to EML conversion for Mac is done and you can find the converted file in the destination folder. 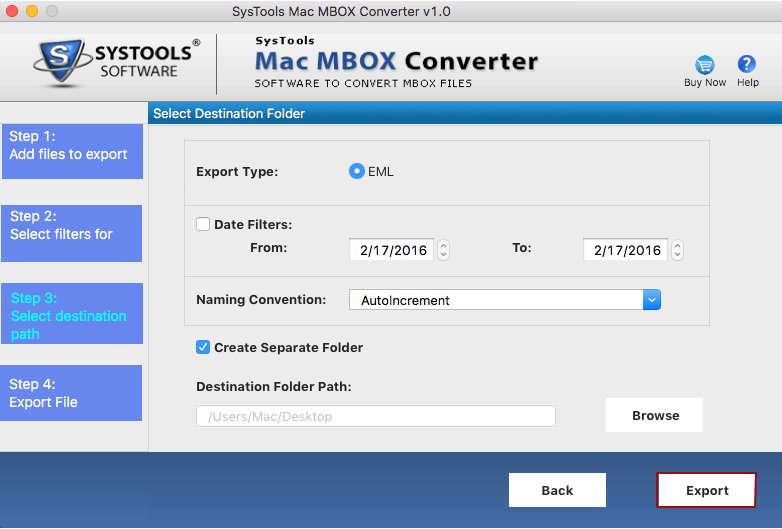 Why MBX to EML Converter for Mac & Windows is Needed? 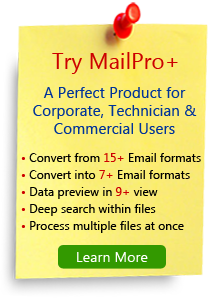 The main benefit from this conversion procedure is that the EML format of emails is supported by a number of email clients such as: Outlook Express, IBM Lotus Notes, Mozilla Thunderbird and Windows Live Mail etc. That's why user starts wondering solution for how to convert MBOX to EML in BULK when he/she require accessing MBOX file emails in any other desktop email client. And for the task this MBOX to EML extractor can be utilized. 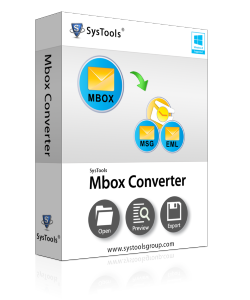 The MBOX converter tool works with multiple functions. Recently I used it for converting MBOX to EML files and done my job accurately. Conversion of multiple MBOX files at a time make it stronger than others. 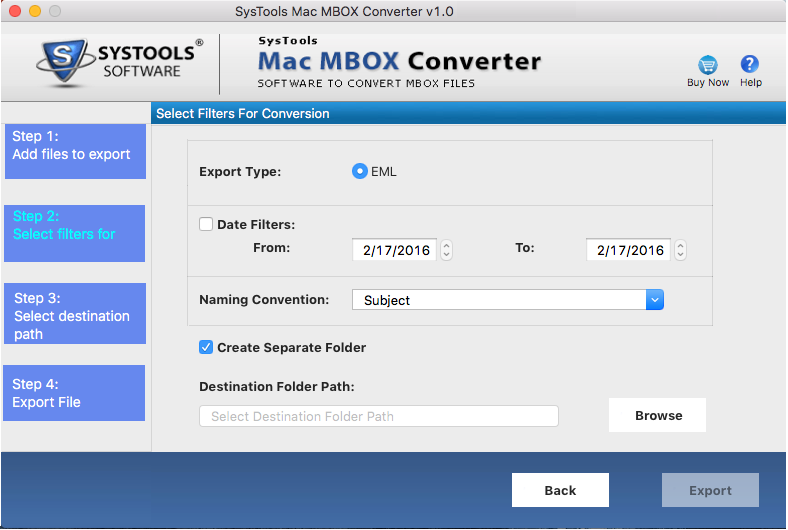 The main benefit of using the MBOX to EML Converter for Mac & Windows is that MBOX file of any email is supported by application on both platforms.